For tractor models 1080B, 1150G, 1150H, 1550, 1835B, 1835C, 1840, 1845B, 1845C, 2366, 2394, 2594, 3394, 3594, 4494, 4694, 5120, 5130, 5140, 5220, 5230, 5240, 5250, 550G, 570LXT, 580 Super E, 580 Super K, 580 Super L, 580D, 580K, 580L, 584E, 585E, 586E, 588G, 590, 590 Super L, 590 Super M, 621, 621B, 650G, 660, 680K, 680L, 7110, 7120, 7130, 7140, 7150, 7210, 7220, 7230, 7240, 7250, 75XT, 760, 780C, 780D, 821, 821B, 821C, 850E, 850G, 855E, 85XT, 860, 8910, 8920, 8930, 8940, 8950, 90XT, 921, 921C, 95XT, C50, C60, MX 100, MX 110, MX 120, MX 135, MX 150, MX 170, MX 180, MX 200, MX 220, MX 240, W11B, W14B, W14C, W18B, W20C, W30, W36. New, aftermarket Ignition Switch for sale with a solid manufacturer warranty. In addition, we have a generous 30-day return policy if this Case Ignition Switch for Case 1080B, 1150G, 1150H, 1550, 1835B, 1835C, 1840, 1845B, 1845C, 2366, 2394, 2594, 3394, 3594, 4494, 4694, 5120, 5130, 5140, 5220, 5230, 5240, 5250, 550G, 570LXT, 580 Super E, 580 Super K, 580 Super L, 580D, 580K, 580L, 584E, 586E, 588G, 590, 590 Super L, 590 Super M, 621, 621B, 650G, 660.680K tractors needs to be returned for any reason. Please see our Parts Warranty and Return Policy links on your left for complete details before returning. Delivery is via UPS Ground or USPS Priority and usually takes 3-5 business days. The shipping charge will be displayed in your online shopping cart. 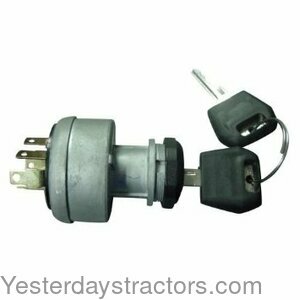 To purchase this ignition switch, click the "Add to Cart" button or call toll-free 800-853-2651.